Abigail Hernandez of North Conway disappeared on Oct. 9 after leaving school. CONWAY, N.H. — Law enforcement officials say a missing New Hampshire teenager who vanished two months ago on her way home from high school was in contact with her mother after she disappeared. 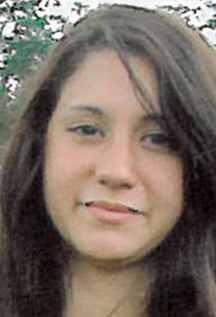 Abigail Hernandez, 15, of North Conway was last seen Oct. 9 after leaving Kennett High School. Police say she walked her normal route toward home and sent several text messages. Abigail Hernandez, 15, of North Conway, N.H., is shown in an undated photo provided by the Conway (N.H.) Police Department. The FBI said it developed information a couple of weeks ago that she had been in touch with her mother after she disappeared but not recently, WMUR-TV reported Thursday. “We don’t know that she is well or safe by any means. In fact, we have grave concerns for her safety,” said Special Agent Kieran Ramsey. Officials said they plan to release new information at a news conference Friday. The girl’s mother said last month that she believes her daughter will come home someday. Zenya Hernandez urged her daughter to be strong. Police have said they don’t know whether Abigail was involved in an accident, ran away or was abducted. There is a $20,000 reward for any information that leads to the safe return of Abigail or to information that leads to the arrest and conviction of anyone involved in her disappearance. The FBI has said that tips continue to come in to its tips line, 1-800-CALL-FBI.